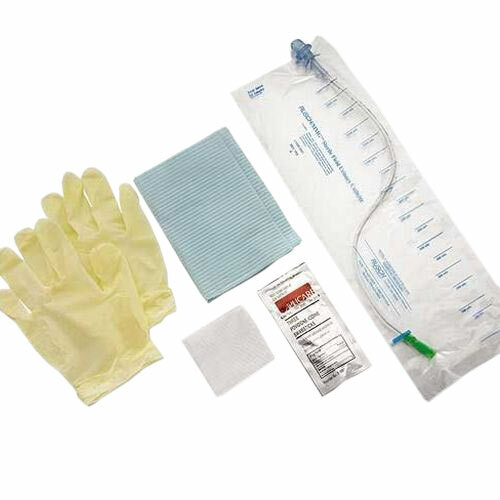 This kit contains a Rusch/MMG Intermittent Urinary Catheter with CoudeTip, gauze tissue, povidone iodine swabs, two gloves and underpad. Medical studies have proven that MMG users are nine times less likely to contract UTI's than those using other conventional methods. Our soft silicone "introducer" tip shields the catheter through the tip of the urethral opening bypassing the majority of urinary tract bacteria. The self-contained intermittent catheter system is fully protected within its own closed sterile field. It is pre-lubricated, the catheter and soft silicone "Introducer" tip are both coated with non-allergenic, water-soluble lubricant for easy insertion. No separate lubrication procedure is needed. The MMG system's vinyl catheter drainage eyelets are recessed and polished and the tips are tapered assuring smoother glide passage through the urethra. The self-contained urine collection bag eliminates the need for separate containers, thus reducing the risk of spillage and allowing for ease of disposal.